Choosing puppy dog toys can be a lot of fun, but it can be challenging too! 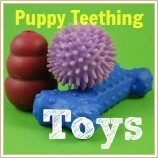 Safe, sturdy toys which can stand up to your puppy's sharp teeth and provide tons of play value are a must. But with all the choices out there, how can you know which ones to pick? Chewing is a normal canine activity, and most adult dogs still love to chomp on a favorite toy or bone. But during the time your puppy is between 3 and 7 months old, the teething phase is in full swing, and your little one needs to have the right toys to bite down on to help relieve the discomfort or pain in his gums. There are lots of excellent choices when it comes to teething toys, but it's important to choose only well-made designs from reputable manufacturers. Your pup may be little, but his teeth are razor sharp and even small breed puppies can do considerable damage with a bout of determined chewing. Poorly constructed cheap toys, made from inferior materials, can splinter, rip or break apart which is dangerous for your puppy. He may choke, or swallow something sharp or otherwise hazardous, and that could mean an emergency trip to the vet's office. 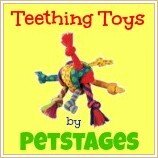 In addition to the chew toys that are designed for teething puppies, there are lots of other great products that can keep your little one happy and active - and out of trouble! 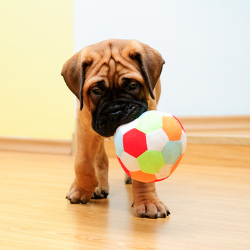 Including balls, rope toys and soft toys, there's literally something for every puppy. Take a look at the selection below (they're some of my favorites) and you're sure to find something that both you and your pup will approve of. I've never met a puppy who didn't adore soft toys. BUT it's tricky to find ones that can take the abuse your little one can dish out! Here are a few soft toys that give you value for money, and that your pup will enjoy playing with over and over again. Of course, the puppy dog toys featured above are just a tiny sampling of the huge variety that you can find in stores and online, but they're good examples of the type of toys that you all puppies enjoy. I'd recommend buying several toys of varying types (as far as budget constraints will allow!) and then making up 2 or 3 groups of different toys which are switched them out every few days. Puppies are like babies and get bored with the same selection day after day. If you give him 3 or 4 toys in each group, and then change those for a different group regularly, he will be more interested in them and less likely to look at your furniture, shoes and other belongings as alternatives!